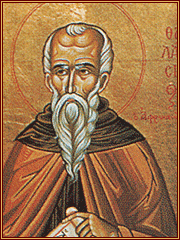 St. Thalassios the Libyan: If you are not willing to repent through freely choosing to suffer . . . This entry was posted in Sayings from Saints, Elders, and Fathers, St. Thalassios the Libyan and tagged Free Will, Quotes from the Philokalia, Repentance, Suffering on July 1, 2014 by . St. Thalassios the Libyan: If you wish to be in control of your soul and body . . . This entry was posted in Sayings from Saints, Elders, and Fathers, St. Thalassios the Libyan and tagged Body, Passions, Quotes from the Philokalia, Self-Control, Short Quotes, Soul, Soul and Body on December 5, 2013 by . St. Thalassios the Libyan: Search the Scriptures . . . This entry was posted in Sayings from Saints, Elders, and Fathers, St. Thalassios the Libyan and tagged Commandments, Holy Scriptures, Passions, Quotes from the Philokalia, Reading the Scriptures, Short Quotes, Spiritual Reading on November 1, 2013 by . St. Thalassios: Concern for one’s soul . . . This entry was posted in Sayings from Saints, Elders, and Fathers, St. Thalassios the Libyan and tagged Forgiveness, Humility, Quotes from the Philokalia, Short Quotes, Sin, Soul on October 23, 2013 by . St. Thalassios the Libyan: Our memories can be stripped of passion . . . This entry was posted in Sayings from Saints, Elders, and Fathers, St. Thalassios the Libyan and tagged Memories, Passions, Prayer, Quotes from the Philokalia, Short Quotes, Spiritual Reading on September 26, 2013 by . St. Thalassios the Libyan: If you share secretly the joy of someone you envy . . . This entry was posted in Sayings from Saints, Elders, and Fathers, St. Thalassios the Libyan and tagged Envy, Gossip, Jealousy, Joy, Passions, Quotes from the Philokalia, Short Quotes, Silence, Spiritual Tools on September 23, 2013 by .